The advent of Agama Sastras made the practice of religion easy for the Hindus. The elaborate ritualism of the vedas and the exacting discipline of the yoga path were obviated by a simple process of idol worship either at home or outside, in temples, Vedanta conceived God as one without form but people started giving him forms according to their mental developments and tendencies. Some gave him animal forms, some gave him human forms and some gave him mixed forms and some represented him in geometrical patterns. 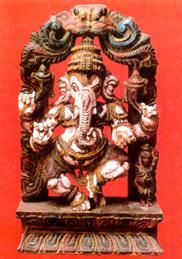 Ganesha comes under the mixed form. These diverse ways of thinking and shaping of Gods arose more out of a desire to satisfy a pristine and innocent urge in men than out of any wanton profanity. But it is unfortunate that the credulity of these innocents is being exploited by some others who are unscrupulous for purposes which may very well be described as profane. God does not want idols or worship. God is an immaculate law and knowledge of this law and obeying the law would be more than sufficient to please Him. This is high thinking. But people at lower levels caught in the grip of their own psychic aberrations require some refuge and the several Gods, their idols and symbols all constitute such a refuge set up for their psychic needs even as they put up shelters variously improvised as refuge for their physical needs from the vagaries of weather.